In an electric blender or a food processor with a metal blade, puree the watercress mixture. In a small cup, combine the cornstarch and one cup of cold milk. Stir in the remaining cup of milk and simmer it for 5 minutes, Here is a refreshing cool, green soup you can enjoy sipping on a warm, sunny day. Watercress and Almond soup is a delight to eat when the heat is on and the more you know about watercress, the more you will appreciate it. Watercress goes way back. At about the time that Plato was studying philosophy under Socrates, the Greek doctor Hippocrates started the first hospital and used watercress to treat blood disorders. He grew this herb in nearby natural springs. Watercress is among the oldest leafy greens consumed by humans and is much more than a garnish. It is loaded with vitamins and minerals. Back in the early sea journey days, scurvy was a problem and we’ve all heard about slivers of lime being given to sailors to prevent scurvy. Lesser known is that a 17th century herbalist celebrated watercress as a remedy for the scurvy problem. When James Cook went around the world he actually took plenty of watercress for him and the crew. Since watercress was served at the very first Thanksgiving with the Pilgrims in New England, it has been acknowledged as an important leafy green vegetable. 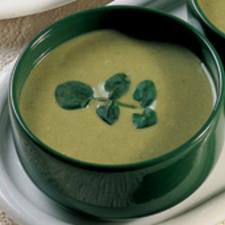 If you have tasted potage cressionniere you have enjoyed watercress in an enchanting hot soup. Today I present watercress in a chilled soup because I want people to eat soup even when the temperature is soaring. If watercress is new to your pantry, get ready for a thrilling expedition when you make watercress and almond soup. Bon voyage, mates. Remove from heat, allowing to cool. Refrigerate at least 4 hours to marry flavours. Interesting and yummy soap !!! I have always wondered about Watercress. I have wondered if it grew in our creek as a kid, and later I wondered if that was water hemlock that was growing there! Almonds and watercress sound good. I will look for watercress...in the grocery store...and then a book with good illustrations...and then maybe in some pure (good luck with that nowadays) stream. thanks! This sounds interesting. I like to serve a cold soup in punch cups along with appetizers at summer parties. I've seen watercress growing in England...we used to hike past a place that was known for its watercress. wow interesting that watercress was served at the first thanksgiving! My mom loved watercress and she would have liked this soup. Me...not so much. The soup might be good though. I liked the story about Socrates and using the watercress to treat blood disorders. Amazing isn't it? I love love love watercress! Hi Anthony, you're almost there! What are you going to do for "X" next?! KALYANI: Thanks Kalyani, it is. SOGGY IN THE CORNER: I kinda' agree with you, I would be hesitant to pick anything wild, except maybe blackberries, which leave cuts all over my hands. Get some watercress and try this soup, it's good and good for you. JOYCE: I know that watercress is popular in certain parts of the UK, and punch cups is a nice presentation. LYNN PROCTOR: Yeah, all that time ago and I bet there are many people who have never tried this green miracle food. LADYDRAGONFLY: Maybe you could re-discover this vegetable; start small with a couple leaves on a sandwich or whatever. Of course, if you truly do not care for it, thats all right then. JOANNE: Good on 'ya Joanne, hope you like this soup too. JAY: You got that right, thanks. DUNCAN D HORNE: I'm going to do one on cactus. Best regards to you and the girls. This soup looks and sounds delicious. I think I'll be giving this one a try. SUSANNE DRAZIC: Thank you, the soup is very healthy and more importantly tastes good. Beautiful soup and photo too! wow. delicious and inviting soup. SPICE UP THE CURRY: It surely is.